The South American Tomato Leaf Miner/ Moth (Tuta absoluta) is the major pest of tomatoes in Brazil. It first appeared in the Mediterranean region in 2006. The spread of the pest has been exceptionally rapid, and it is now present throughout Europe, the Middle East and North Africa. The main method of dispersal is believed to be with harvested tomatoes, as the Tuta absoluta larvae emerge from the fruit post-harvest and pupate in the boxes used for shipment. First captures of moth infestations are often found in pheromone traps placed inside packing houses where imported fruit is being processed. It is a lepidopteran leaf miner that can have up to 12 generations in a year, with each female producing up to 250 eggs. The larvae are voracious feeders. They will burrow into leaves, creating characteristic galleries, as well as into stems and fruit. 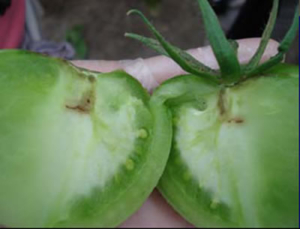 The damage can often cause complete crop loss. Tuta absoluta has a high reproductive potential. Larvae don’t enter diapause as long as food is available. The biological cycle is completed in 29–38 days depending on environmental conditions. Studies in Chile have shown that development takes 76.3 days at 14°C, 39.8 at 19.7 °C and 23.8 at 27.1 °C. Adults are nocturnal and usually hide during the day between leaves. Females lay eggs on aerial parts of their host plants. Four larval instars develop. Young larvae appear at the end of winter. 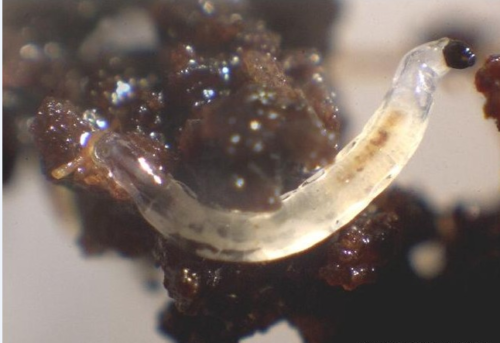 Pupation may take place in the soil, on the leaf surface or within mines, depending on environmental conditions. When Tuta absoluta does not pupate in the soil, a cocoon is usually built. The pest may overwinter as eggs, pupae or adults. 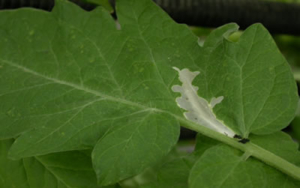 The pest will attack the tomato plant at any stage, even when the plant has only a few developed leaves. 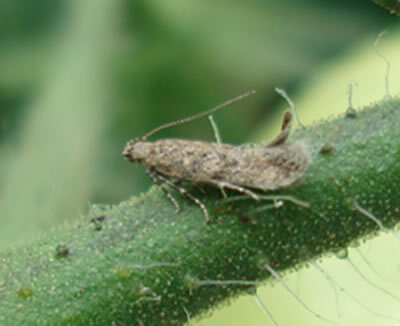 Tuta absoluta is a pest that is vulnerable to predators and parasites. Natural reductions in infestations can be as high as 75% from a combination of predation from predatory bugs and native parasites. There is growing evidence that naturally occurring parasites are adapting to T. absoluta in Spain, and reducing the levels of pest infestation in the local environment. The first line of defence against Tuta absoluta is correct use of pheromone traps inside and outside of the greenhouse. This can be followed by early introductions of predatory bugs such as Macrolophus caliginosus or Nesidiocoris tenuis. The biopesticide Bacillus thuriengensis will also give a significant contribution to control. Parasites such as Trichogramma spp, Necremnus spp and Diadegma leicole will also give suppression of infestations. Hygiene is also very important. Thorough removal of crop waste at the end of the season will reduce the number of Tuta absoluta surviving to infest subsequent crops.